There are a number of education-related science experiment web pages claiming that a simple classroom experiment can demonstrate the physics of the Earth's "greenhouse effect". This is simply not true. 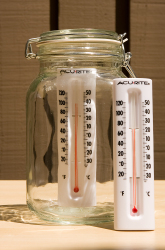 On the tiny scale of a jar (even a jar ten feet tall), the infrared absorption effects of carbon dioxide are too weak to be measured using just a thermometer. This is true even if the jar is filled with pure carbon dioxide. There are other reasons why the experiment won't work, but this is the main one. Even a more sophisticated experiment where two identical jars, one with regular air, and one with pure CO2, like that shown in Al Gore's and Bill Nye's Climate 101 video, cannot work because the total amount of carbon dioxide is far too small. It appears that the video actually faked the results of that experiment in post-production. By far the best demonstration of the greenhouse effect is with a handheld IR thermometer pointed at the sky in different directions, in dry versus humid conditions, and at clouds. The greenhouse effect operates by downward infrared emission from the sky warming the surface, which is exactly what happens inside a handheld IR thermometer when it is pointed at the sky.